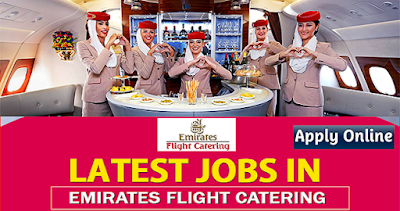 Latest Jobs In Emirates Flight Catering Dubai. Emirates airlines are one of the most prestigious employers in the UAE region. Offering a multicultural workplace which employs more than 10,000 people from 50 countries worldwide, Emirates Flight Catering was established back in 1982, and have taken a lot of pride in creating an innovative and inclusive working environment which has formed the backbone of their success. The latest jobs in Emirates Flight Catering Dubai offer the chance to work for an advanced company as well as impressive professional growth opportunities, advanced training in operational management and food safety and a sense of accomplishment. There are careers in a number of niches for both entry level and experienced candidates, so if you're interested in applying for the latest jobs in Emirates flight catering Dubai, you're sure to find a suitable role to meet your needs. Culinary and Food Production - preparing a wide range of delicious internationally inspired meals. Hospitality - food and drink service in the business class and first class lounges at Dubai International Airport. Support Services - including safety, human resources, food hygiene, IT, finance, quality control, supply chain, procurement and engineering. Whether you are already a professional in the industry or whether you are looking for the first step on the career ladder, there are roles to suit every applicant. There are also full and part time roles to suit the needs of all candidates. You should begin your job search for the latest jobs in Emirates flight catering Dubai at the company's own careers page online. Here you can perform an advanced job search which enables you to search by location. Simply input "Dubai" into the location criteria and you will immediately see the positions which are available in your area. You can also search by several other criteria including job sector and keyword. You can also find current listings for vacancies at Emirates Flight Catering on several general job listing websites including Indeed, Gulftalent and Gulfjobcareers. The skills and experienced required by job applicants will vary depending on the position applied for. For an entry level post, candidates will probably only be required to have a good level of high school education, however for more senior posts considerable experience and industry-relevant qualifications will be required. Some roles require a certain level of personal fitness for loading and unloading items onto the aircraft and staff who are working in the food production side of the business will need to have a food safety certificate as well as significant understanding of diet and nutrition in order to prepare suitable meals. The best and easiest way to apply for the latest jobs in Emirates flight catering Dubai is to apply through the company's own website. When you have found a job to suit your skills and experience, you can click on the Apply tab and complete your personal details as well as uploading your current CV and experience. Your application will then be passed on to the recruitment team who will contact you if you are required to attend an interview.